What is the path that food takes through the digestive system in your body? 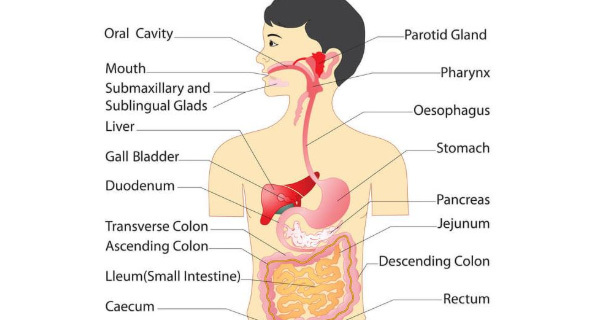 The Digestive System Parts are mentioned and explained below with the functions of all these parts. The Secretion is also mentioned in the table. Lips and Cheeks Manipulation of food, hold food in position between teeth, communication. Saliva from buccal glands (only mucous). Tongue Manipulation of food, hold food in position between teeth, cleaning of the teeth and the taste. Some mucous and small amount of serous fluid. Parotid Glands Secretion of saliva through ducts to superior and posterior part of oral cavity. Saliva with amylase. Sub-Mandibular Glands Secretion of saliva in floor of oral cavity. Saliva with amylase and mucous. Sublingual Glands Secretion of saliva in floor of oral cavity. Mucous saliva only. Deglutition (movement of food from oral cavity to esophagus). Some mucous. Movement of food by peristalsis from pharynx to stomach. Mucous. Gall Bladder Bile storage, absorb water and electrolytes into concentrate bile. None of its own secretion stores and concentrates bile. pancreas Secretion of several digestive enzymes and bicarbonate ion into duodenum. Trypsin, chemotrysin, pancreatic amylase, pancreatic lipase, bicarbonates. Absorptive cells Secretion of digestive enzyme and absorption of digestive materials. Enterokinase, amylase, peptidases, sucrose, maltase, lactase, lipase. Endocrine cells Regulation of secretion and motility. Gastrin, secretin. Globlet cell Absorption, storage and food movement, protection. Mucous.